Boys and girls, we've just found your fave summer dress. 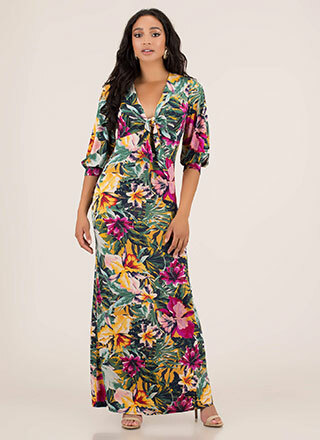 Stretchy, sleeveless maxi dress features a plunging deep-V neckline, a foldover ruffled panel that cascades down the front, and an allover, multi-colored, abstract swirly print. Dress is finished with non-adjustable spaghetti straps that crisscross over the back. No closures are included. Pattern placement may vary.